متولی عنبران, سید هانی, ابراهیم‌زاده اردستانی, وحید, زین, هرمان. (1391). تعیین مدل پوسته و سنگ‌کره نواحی البرز، ایران مرکزی و خزر جنوبی با استفاده از داده‌های ژئوئید وتوپوگرافی. 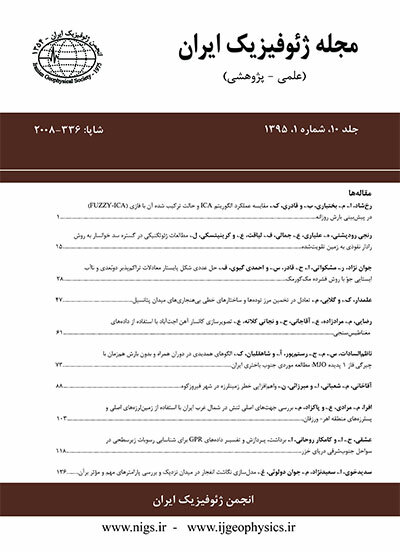 مجله ژئوفیزیک ایران, 6(1), 1-11. سید هانی متولی عنبران; وحید ابراهیم‌زاده اردستانی; هرمان زین. "تعیین مدل پوسته و سنگ‌کره نواحی البرز، ایران مرکزی و خزر جنوبی با استفاده از داده‌های ژئوئید وتوپوگرافی". مجله ژئوفیزیک ایران, 6, 1, 1391, 1-11. متولی عنبران, سید هانی, ابراهیم‌زاده اردستانی, وحید, زین, هرمان. (1391). 'تعیین مدل پوسته و سنگ‌کره نواحی البرز، ایران مرکزی و خزر جنوبی با استفاده از داده‌های ژئوئید وتوپوگرافی', مجله ژئوفیزیک ایران, 6(1), pp. 1-11. متولی عنبران, سید هانی, ابراهیم‌زاده اردستانی, وحید, زین, هرمان. تعیین مدل پوسته و سنگ‌کره نواحی البرز، ایران مرکزی و خزر جنوبی با استفاده از داده‌های ژئوئید وتوپوگرافی. مجله ژئوفیزیک ایران, 1391; 6(1): 1-11. در این تحقیق از مدل‌سازی هم‌زمان داده‌های ژئوئید، توپوگرافی، مفاهیم پایه فیزیک و ریاضی و هم‌ایستایی (isostasy) محلی به‌‌منظورتعیین ضخامت پوسته و مدل سنگ‌کره در مناطق فعال از نظر زمین‌‌شناسی، که همواره از موضوعات مورد توجه محققان است، استفاده شده ‌است. روش حاضر علاوه بر دقت خوب و سازگاری زیاد با پدیده‌های زمین‌شناسی، نسبت به روش‌های دیگر، سرعت زیاد و هزینه اندکی دارد. از دیگر مزایای این روش می‌‌توان به امکان بررسی هم‌زمان جغرافیایی محدوده‌‌ای وسیع و مقایسه چندساختار متفاوت زمین‌شناسی در کنار یکدیگر اشاره کرد. مدل‌سازی روی نواحی شمالی فلات ایران شامل قسمت‌‌های شمالی ایران‌مرکزی، رشته‌کوه البرز و حوضه خزر جنوبی صورت گرفته است. نتایج حاصل به‌وضوح، ضخیم‌شد‌گی پوسته در زیر البرز تا ضخامت حدود 55 کیلومتر را نشان می‌‌دهد. ضخامت پوسته و سنگ‌کره در ایران‌مرکزی به نسبت نواحی مجاور کاسته شده است و به حدود 36-38 کیلومتر برای ژرفای موهو و 140 کیلومتر برای ژرفای مرز سنگ‌کره-‌‌نرم‌کره می‌رسد. هرچند فرورانش ورقه خزر به زیر ورقه اوراسیا به‌وضوح قابل رویت است لیکن در منطقه کپه‌داغ مشاهده نمی‌شود. Geological events and the curiosity of human mind to comprehend these phenomena compel the researchers to investigate their structures and tectonic evolution. Some key parameters to better understand these subjects are Moho Depth (the boundary between crust and mantle) and also the Lithosphere-Asthenosphere Boundary (LAB). There are methods available which can give us some knowledge about these key parameters such as seismic, magnetotelluric, volcanologic and etc. Each one has advantages and disadvantages. In the seismological method, a period of about six months is needed to be sure that a reasonable quantity and quality of events has been detected to record enough data during the research. The high expense of instruments and lack of access roads in high topography has limited this method to adequately capture the data researchers seek. These problems also exist in the seismic base method. The seismic method is generally expensive. Moreover, this method is nearly blind in lithospheric depth such as LAB. We tried to introduce another method that used potential field data. Our data were topography and geoid undulation mainly observed by satellites. The method for this study utilizes some basic concepts such as local isostasy as wel as some basic physical and mathematical rules, relations and equations. Our topography data were from the newly released topography database for all over the world, ETOPO1. The spatial resolution of the data were 1 Arc-minute. The geoid undulation was calculated by a spherical harmonic up to order 2159 and degree 2190 from Earth Gravitational Model's 2008 (EGM2008). To avoid the effects of anomalies deeper than LAB, wavelengths greater than 4000 km were removed. There were some advantages to this method such as: the higher speed of the calculation so that the examination of a big region was possibile at a fraction of the cost for other methods. Modeling was done on a very substantial area in the Northern part of the Iranian plateau that included the Northern part of Central Iran, the AlborzMountains and the SouthCaspianBasin. The results showed the evidence of thickening of the crust up to ~55 km underneath the AlborzMountains. However, many previous researchers concluded no roots there. The other outcome of utilizing this method was thinning the crust and lithosphere underneath the Northern part of Central Iran (36-38 km for the crust and 140 km for the LAB) relative to the surrounding area. Our data reflected a solid correlation with some previous work and geological evidence. Subduction of the south Caspian basin (probable oceanic crust) underneath the Eurasia plate is completely visible; however, this activity was not recognized in Kopet-Dagh. Allen, M. B., Vincent, S. J., Alsop, G. I., Ismail-zadeh, A., and Flecker, R., 2003, Late Cenozoic deformation in the South Caspian region: effects of a rigid basement block within a collision zone, Tectonophysics, 366(3-4), 223-239. Amante, C. and Eakins, B. W., 2009, ETOPO1, 1 Arc-Minute Global Relief Model: Procedures, Data Sources and Analysis. NOAA Technical Memorandum NESDIS NGDC-24, 19 pp. Artyushkov, E. V., 2007, Formation of the superdeep South Caspian basin: subsidence driven by phase change in continental crust, Russ. Geol. Geophys., 48, 1002-1014. Ashtari, M., Hatzfeld, D., and Kamalian, N., 2005, Microseismicity in the region of Tehran, Tectonophysics, 395 (3-4), 193-208. Asudeh, I., 1982, Seismic structure of Iran from surface and body wave data, Geophys. J. Roy. Astr. Soc., 71, 715-730. Bagheri, S., and Stampfli, G. M., 2008, The Anarak, Jandaq and Posht-e-Badam metamorphic complexes in central Iran: New geological data, relationships and tectonic implications: Tectonophysics, 451, 123-155. Bowin, C., 1983, Depth of principal mass anomalies contributing to the Earth's Geoidal Undulations and gravity anomalies, Marine Geodesy, 7, 61-100. Brunet, M. F., Granath, J. W., and Wilsmen, M., 2009, South Caspian to Central Iran Basins: introduction: The Geological Society, London, Special Publications, 312, 1-6. Brunet, M. F., Korotaev, M. V., Ershov, A. V., and Nikishin, A. M., 2003, The South Caspian Basin: a review of its evolution from subsidence modelling, Sedimentary Geology, 156(1-4), 119-148. Dehghani, G., and Makris, J., 1984, The gravity field and crustal structure of Iran, N. Jahrb. Geol. Paläont. Abh., 168, 215–229. Egan, S. S., Mosar, J., Brunet, M. F., and Kangarli, T., 2009, Subsidence and uplift mechanisms within the South Caspian Basin: insights from the onshore and offshore Azerbaijan region, in South Caspian to Central Iran Basins, in South Caspian to Central Iran Basins, edited by M. F., Brunet, M. Wilmsen and J. W. Granath, The Geological Society, London, Special Publications, 312, 219-240. Glumov, I. F., Malovitskiy, Y. P., Novikov, A. A., and Senin, B. V., 2004, Regional geology and oil and gas content of Caspian Sea (in Russian), Nedra, Moscow. Golonka, J., 2007, Geodynamic evolution of the South Caspian Basin, in Oil and gas of the Greater Caspian area, edited by P. O. Yilmaz and G. H. Isaksen, AAPG, 55, 17-14 Tulsa, Oklahoma. Granath, J. W., Soofi, K. A., Baganz, O. W., and Bagirov, E., 2007, Gravity modeling and its implications to the tectonics of the South Caspian Basin, in Oil and gas of the Greater Caspian area, edited by P. O. Yilmaz and G. H. Isaksen, AAPG, 55, 43-46, Tulsa, Oklahoma. Green, T., Abdullayev, N., Hossac, J., Riley, G., and Roberts, A. M., 2009, Sedimentation and subsidence in the South Caspian Basin, Azerbaijan, in South Caspian to Central Iran Basins, edited by M. F. Brunet, M. Wilmsen and J. W. Granath: The Geological Society, London, Special Publications, 312, 241-260. Guest, B., Guest, A., and Axen, G., 2007, Late Tertiary tectonic evolution of northern Iran: A case for simple crustal folding, Global and Planetary Change, 58(1-4), 435-453. Haxby W. F., and Turcotte D. L., 1978, On isostatic geoid anomalies, J. Geophys. Res. 83, 5473–5478. Jackson, J., Priestley, K., Allen, M. and Berberian, M., 2002, Active tectonics of the SouthCaspianBasin, Geophys. J. Int., 148(2), 214-245. Javan Doloei, G., and Roberts, R., 2003, Crust and uppermost mantle structure of Tehran region from analysis of teleseismic P-waveform receiver functions, Tectonophysics, 364(3-4), 115-133. Knapp, C. C., Knapp, J. H., and Connor, J. A., 2004, Crustal-scale structure of the South Caspian Basin revealed by deep seismic reflection profiling, Mar. Petr. Geol., 21(8), 1073-1081. Lachenbruch, A. H., 1978, Heat flow in the Basin and Range province and thermal effects of tectonic extension, PAGeophy, 117, 34-50. Lachenbruch, A. H., and Morgan, P., 1990, Continental extension, magmatism and elevation; formal relations and rules of thumb, Tectonophysics, 174, 39-62. Molinaro, M., Zeyen, H., and Laurencin X., 2005a, Lithospheric structure beneath the south-eastern Zagros Mountains, Iran: recent slab break-off?, Terra Nova, 17(1), 1-6. Mostafanejad, A., Shomali, Z. H., Mottaghi, A. 2011, 3-D velocity structure of Damavand volcano, Iran, from local earthquake tomography: Journal of Asian Earth Sciences. Ockendon, J. R., and Turcotte, D. L., 1977, On gravitational potential and field anomalies due to thin mass layers, Geophys. J. Roy. Astr. Soc. 48, 479–492. Paul, A., Kaviani, A., Hatzfeld, D., Vergne, J., and Mokhtari, M., 2006, Seismological evidence for crustal-scale thrusting in the Zagros mountain belt (Iran), Geophys. J. Int., 166(1), 227-237. Paul, A., Hatzfeld, D., Kaviani, A., Tatar, M., and Péquegnat, C., 2010, Seismic imaging of the lithospheric structure of the Zagros mountain belt (Iran), Geological Society, London, Special Publications, 330, 5-18. Pavlis, N. K., Holmes, S. A., Kenyon, S. C., and Factor, J. K., An Earth Gravitational Model to Degree 2160 :EGM2008, presented at the 2008 General Assembly of the European Geosciences Union, Vienna, Austria, April 13-18, 2008. Radjaee, A. H., Mokhtari, M., Priestley, K., and Hatzfeld D., 2007, Variation of Moho Depth in the Central Alborz (in Persian), Geosciences, Geological Survey of Iran, 64. Radjaee, A. H., D. Rham, M. Mokhtari, M. Tatar, K. Priestley, and D. Hatzfeld, 2010, Variation of Moho depth in the central part of the Alborz Mountains, northern Iran, Geophys. J. Int., 181(1), 173-184. Ritz, J. F., BNazari, H., Ghassemi, A., Salamati, R., Shafei, A., Solaymani, S., and Vernant, P., 2006, Active transtension inside central Alborz: A new insight into northern Iran-southern Caspian geodynamics, Geology, 34(6), 477-490. Ritz, J. F., Sedighi, M., and Tavakoli, F,. 2004a, Deciphering oblique shortening of central Alborz in Iran using geodetic data, Earth and Planetary Science Letters, 223(1-2). Sodoudi, F., Yuan, X., Kind, R., Heit, B., and Sadidkhouy, A., 2009, Evidence for a missing crustal root and a thin lithosphere beneath the Central Alborz by receiver function studies, Geophys. J. Int., 177(2), 733-742. Tatar, M., 2001, Étude sismotectonique de deux zones de collision continentale: le Zagros Central et l'Alborz (Iran), PhD thesis, Université de Grenoble, Grenoble, France. Turcott, D. L., and Schubert, G., 1982, Geodynamics. Application of Continuum Physics to Geological Problems, John Wiley & Sons, New York. Vernant, P., Nilforoushan, F., Chéry, J., Bayer, R., Djamour, Y., Masson, F., Nankali, H., Ritz, J. F., Sedighi, M., and Tavakoli, F,. 2004a, Deciphering oblique shortening of central Alborz in Iran using geodetic data, Earth and Planetary Science Letters, 223(1-2), 177-185. Vernant, P., Nilforoushan, F., Hatzfeld, D., Abbassi, M. R., Vigny, C., Masson, F., Nankali, H., Martinod, J., Ashtiani, A., Bayer, R., Tavakoli, F., and Chéry, J., 2004b, Present-day crustal deformation and plate kinematics in the Middle East constrained by GPS measurements in Iran and northern Oman, Geophys. J. Int., 157(1), 381-398. Zeyen, H., and M. Fernàndez, 1994, Integrated lithospheric modeling combining thermal, gravity and local isostasy analysis: application to the NE Spanish Geotransect, Journal of Geophysics Research, 99, 18089-18102.